The horses of Venice, formerly on the Arc du Carrousel, today above the porch of the Basilica of San Marco. 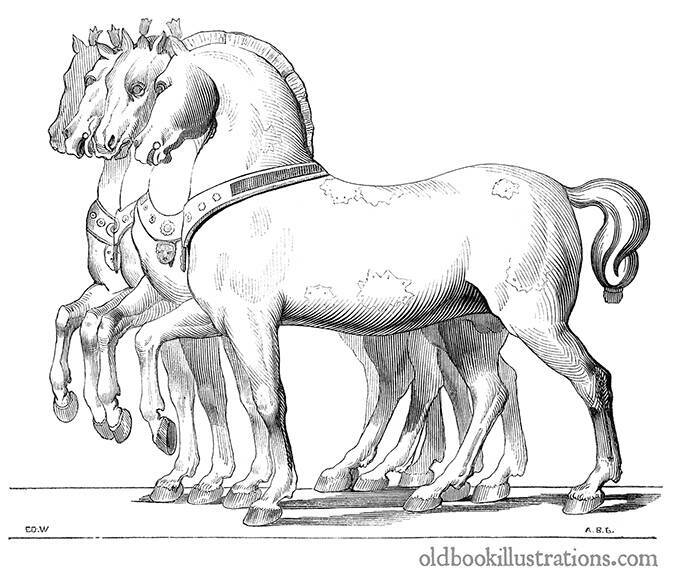 The four horses of San Marco can be seen on the west façade gallery of Saint Mark’s Basilica in Venice. These bronze sculptures used to be part of a Greco-Roman quadriga that was displayed for a long time at the Hippodrome of Constantinople. They were brought to Venice in 1204 at the time of the Fourth Crusade and set up at St Mark’s Basilica in the middle of the thirteenth century. In 1797, Napoleon had them moved to Paris where they remained before being returned to Venice in 1815. The caption reads in the original French: Les Chevaux de Venise, autrefois sur l’arc du Carrousel, aujourd’hui au portail de Saint-Marc.